1916 – 2016 How will the Four Courts commemorate? A photograph taken after the surrender taken from the Judges yard looking out of the Chancery Place gates. framed in the gates is the front door of the Medical Mission. The barricade inside the gates was erected by the rebels. The mattresses came from the Fourcourts Hotel. Some of the furniture they used will look remarkably familiar to current law library members! enlarged and grainy photograph of Bevan in his volunteer uniform, his chest crossed with leather bandoleers. extracted from the Mission by getting into the back of improvised armoured cars made of Guinness boilers. 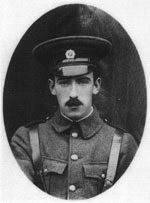 Edward Daly, commandant of the 1st Battalion of the Dublin Volunteers. He was aged 25 when executed at Kilmainham. 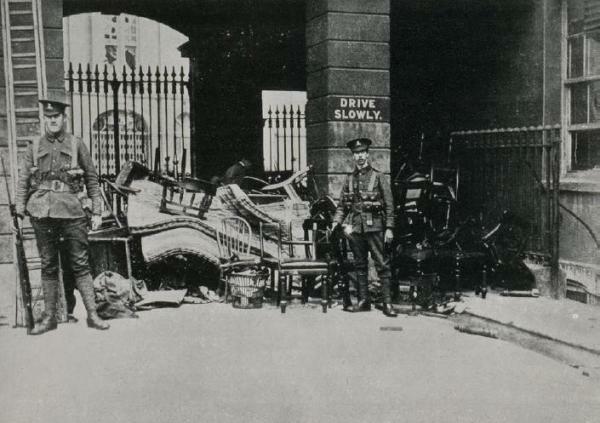 Inside the Four Courts command was in the hands of 25 year old Edward Daly. He was also responsible for capturing the Bridewell to the rear of the courts and he kept prisoner there some of the Bridwell police officers and all of the army pay corps soldiers taken prisoner when the rebels burnt down their barracks at Linenhall, up near the Kings Inns. Although not a signatory to the proclamation Edward Daly still went to the firing squads at Kilmainham. As yet, at least to my knowledge, no mention of him appears anywhere within what the Courts Service now calls the Four Courts campus. Over on the western side of the courts building volunteer Lieutenant Thomas Allen was shot dead in the Records Office, ( now Courts 22 and 23), during a machine gun attack by soldiers advancing through Smithfield. You can still see scarring from the machine gun damage to the building as you walk up Church Street. From Moyville Co. Meath, Thomas Allen left a widow and three children. Who now, who works in or frequents Courts 22 or 23 knows of Thomas Allen, who gave his life in the creation of an independent Ireland?. what are the plans for the Four Courts? The issue has yet to be considered by the Courts Service, or by those who work within it’s environs. But in the spirit of the matter it is not too early to suggest some possible acts of commemoration. to barrister Francis Henry Browning who was shot dead on Mount Street by rebel forces under the command of De Valera. So how about one of the two courts in the old Record Office, court 22 or 23, being named as the Allen Court; Should the Irish bay, where hangs the Bevan portrait, be re-named the Bevan Bay? rebel fire for three days. As for Daly, his name must be recorded somewhere within the Campus. We have an Áras Uí Dhálaigh after the sixth President and former Chief Justice Cearbhall O Dhálaigh, surely we can afford to have a Daly room, a Daly court or a Daly bursary prize, Can we not just cast his name in the doorstep of some prominent entrance. Cannot we just remember him? For further reading on the role of the Four Courts in the Rising read Paul O’Brien’s book: Crossfire – The battle of the Four Courts 1916, published by New Ireland Press. Review of Crossfire – The battle of the Four Courts 1916. I suspect that Ned Daly, like Willie Pearse, was killed for his association – he was Thomas Clarke’s brother-in-law. Thomas Allen was my mum’s uncle. I don’t know that much about him at all though. We must be related! Thomas Allen is my great grandfather on my mother’s side. I believe Thomas Allen came from Longwood Meath? Am I wrong? Does anybody know his parents names? My grand aunt actually held Thomas Allen’s head while Fr. Augustine anointed him while he lay dying.